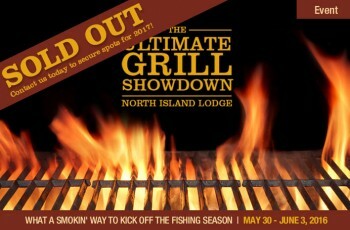 Kick off the season at North Island Lodge May 29 to June 2, 2017 with our third annual Ultimate Grill Showdown. 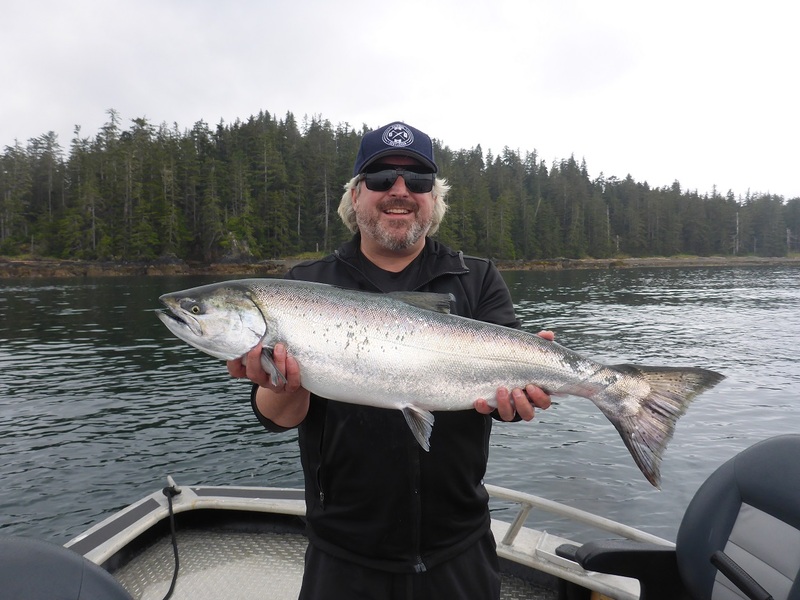 It doesn’t get any better than spending the day out on the water enjoying the world’s best Salmon fishing and coming home to chef demonstrations and BBQ fare far beyond your wildest imagination. 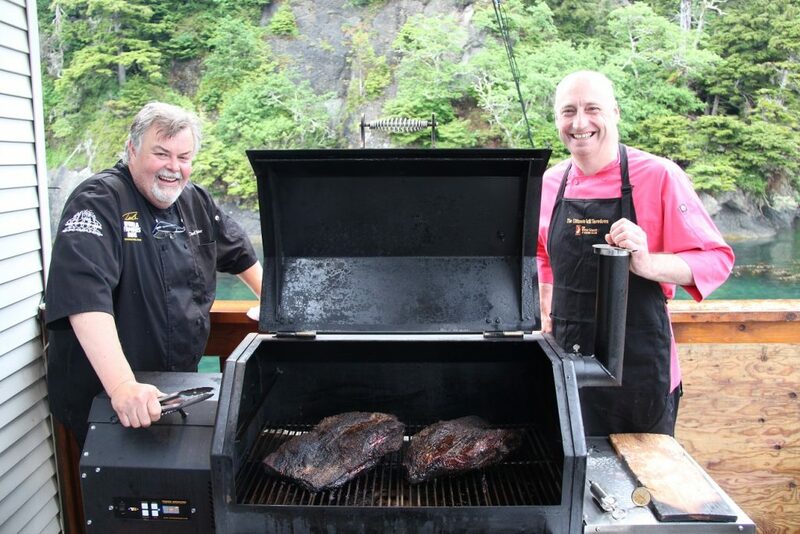 * Ted Reader and Andy Annat around the finished 12 hour brisket on the Yoder Smoker. * Greg Cosway with a nice Chinook. * Park Heffelfinger, owner and founder of Memphis Blues Barbeque House, taking the baby back ribs off the flaming Napoleon grill. Join celebrity BBQ chefs from across North America who will take you on a grilling adventure learning how to grill your catch as well as supply you with firsthand knowledge of their signature recipes. 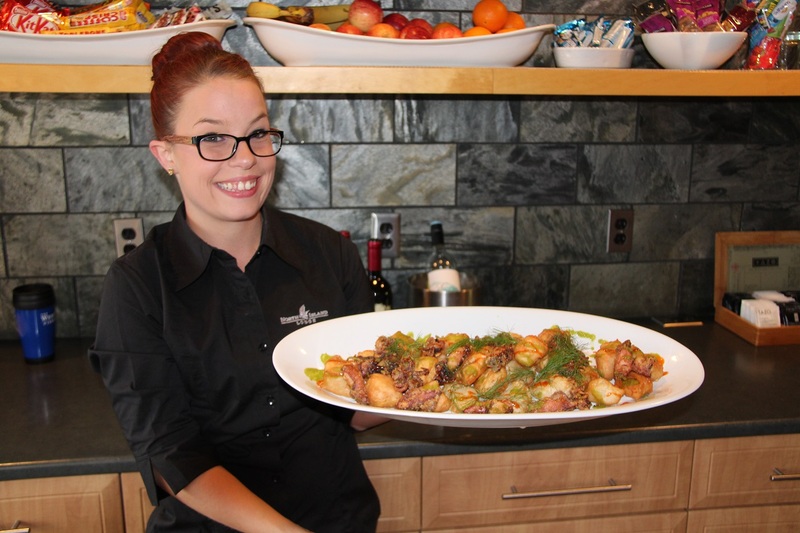 Once again in 2016, the first guests of the year at North Island Lodge knew they were in for more than a fishing adventure when they touched down at Beale Cove on May 30 for the second annual Ultimate Grill Showdown. 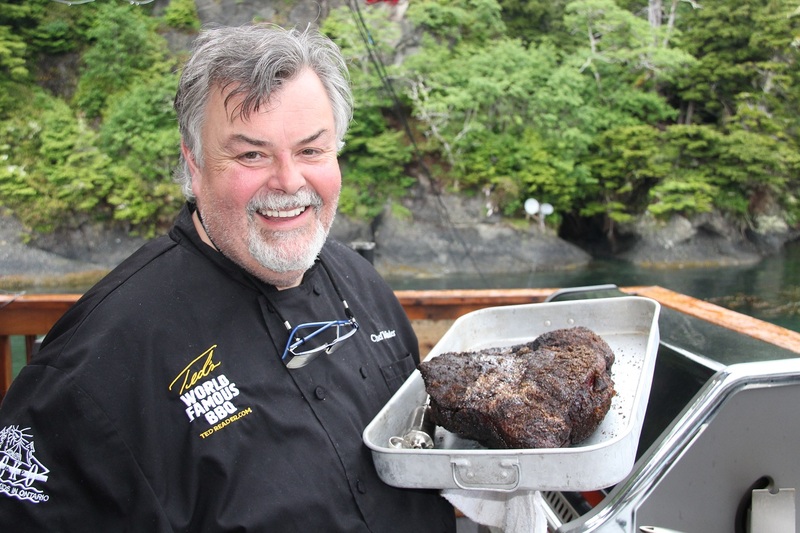 Canada’s own Godfather of the Grill, Ted Reader, was once again one of the featured chefs in what has turned out to be a new season-opening tradition for North Island Lodge and a smoky salute to barbeque cuisine. * Ted Reader “The Godfather of the Grill” and his 12 hour smoked brisket. Although inspired by the rich food culture of the American southwest, the culinary offerings were far from conventional, as the always-entertaining Chef Reader dug deep into his well of expertise to produce a wide range of sophisticated fare using the finest ingredients from land and sea. 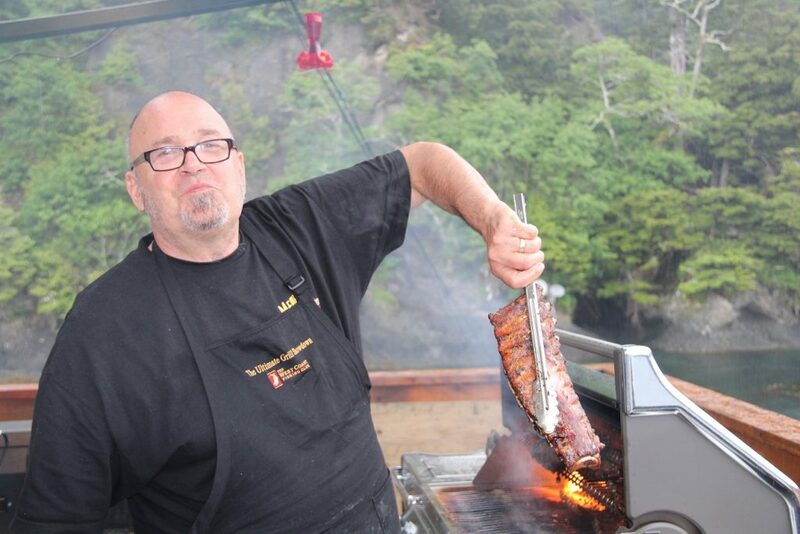 He also spiced things up by inviting “International Barbeque Crackerjack” Andy Annat, who is leading a barbeque revolution in Europe from his home in Yorkshire, England. Also back for a second year as guest chefs were Park and Charmaine Heffelfinger, the personable and gracious owners of Vancouver-based Memphis Blues Barbeque House. * Carrying on with the tradition of family style dining established by the late Walter Pelliccia, Ted Ready and Andy Annat present their family style meal. 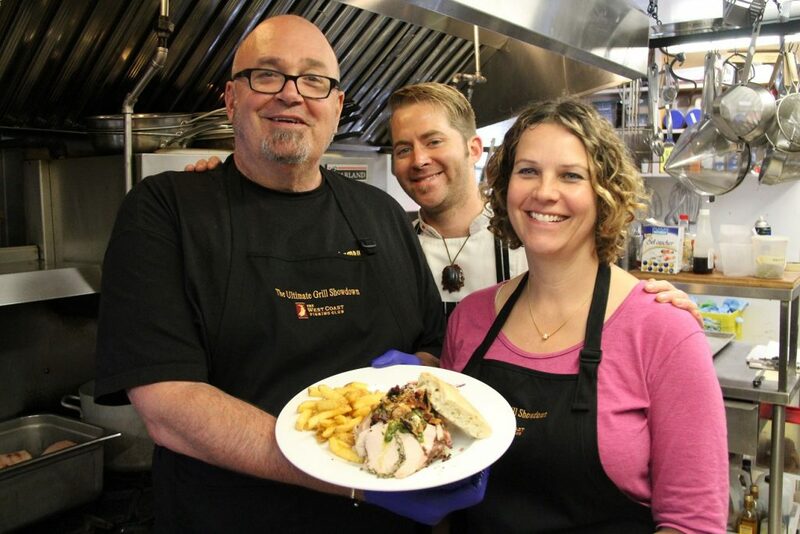 * Park Heffelfinger, Liam Paul and Charmaine Heffelfinger with their featured lunch on day 2 – Porcetta sandwiches. 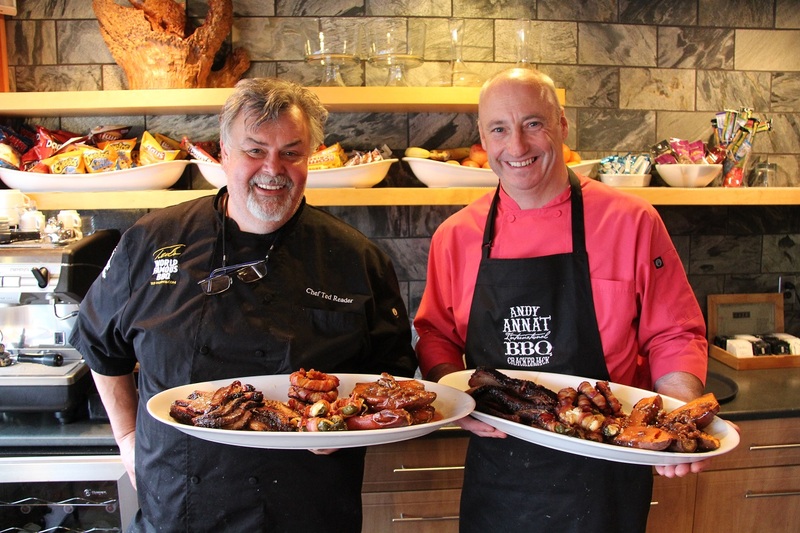 Once these pit-masters teamed up with executive chef Liam Paul’s kitchen crew, there was no stopping the afternoon and evening parade of mouth-watering menu items that ranged from 12-hour Smoked Brisket, to Cedar-planked Tiger Prawns, to Smoked Spring Salmon with Maple Syrup. Main courses followed such tempting appetizers as Scallop, Squid and Spot Prawn Ceviche, and Potato Crusted Crab Stuffed Prawns. Desert courses were equally diverse, ranging from Lemon Sponge Cake with Mixed Berry Ice Wine Reduction to Buttermilk Pie with Rhubarb Strawberry Compote. Having played to a sold-out house for a second consecutive year, The Ultimate Grill Showdown is sure to remain a popular special event trip and a superb way to kick off the season at Langara Island. It all goes down again May 29 to June 2, 2017 so best to book your table for next year’s big smoke now. Click here for the full 2016 Ultimate Grill Showdown report.